The good news is spring is here on the Grand River and so are the smallmouth. The bad news is, so is a proposal to the dredge the Grand River. which has nothing to do with the Grand River Restoration project. I’ll get to the dredging in a minute. The Grand right now is high, dirty and moving fast. The crowds at the dam in Grand Rapids are gone and we have the river back to ourselves. It’s finally nice to enjoy the quiet solitude of this river. There are still some steelhead in the system but for the most part they are far and few in-between. We have been seeing steelhead roll back over the dam, moving as fast as they can out to the big lake. We have been transitioning over to smallmouth and northern pike and it feels good to be back in the warmwater game. Water temps are running between 48 and 50 degrees depending on the day and the fish are hungry. The river is high and dirty. However, with that said there is about a foot and half of clarity, not to bad for the Grand. When targeting smallmouth your allies, in these conditions, are going to be lures that create vibration and noise. Success for us has been the 3/8 oz. double bladed willow leaf spinnerbait in both black and white. Use leaders with 15 lb fluorocarbon tied to 30 lbs hi-viz Power Pro braid. In these conditions, the best places to fish are going to be the feeder creeks and right up against the bank. Fortune favors the bold and you’ll need to cast as far up those feed creeks as you can. Don’t be afraid to lose a some hardware along the way. For those you that don’t know, there is a developer, Dan Hibma, that would like to dredge the Grand River from Fulton Street in Grand Rapids to the Bass River Outlet in Eastmanville. That’s 23 miles. He feels that there are powerboaters that would like to take their boats from Lake Michigan all the way up to Grand Rapids. In addition, he wants to put a marina right by Johnson Park in Grandville. I wonder how they would get to the marina after last years flooding event when the Grand peaked at 42,000 cfs. In the 12th hour, during the republican lame duck session last year, then Senator Arlen Meekhof slipped into legislation over $3.0 million for dredging. He thought that no-one would see it. There has been no public meetings on it, no citizen involvement and no input. Seems all shady to me. Oh and did I mention that the developer owns 200 acres of land on the Grand River. Oh, he has also offered up his property as a site to put the dredge spoils, so he can develop it. Thankfully, there is a group called Friends of the Lower Grand River that has organized to stop this. Through their efforts, and the turnout of Ottawa County citizens, it appears that the Ottawa County Commissioner’s will vote to oppose the dredge. In addition, a number of local municipalities have also passed resolutions opposing it. However, like all things that are environmentally destructive, projects like this are like zombies, they never die. The only way this gets stopped is through the legislature. Mr. Meekhof, when he added the appropriation rider did it in a way that if the money is not used in a given year it rolls over into the next and so. Again, shady. I don’t have to say, if the dredging goes through one of Michigan’s best steelhead runs will be destroyed. If the Grand River is dredged, 50 feet wide by 7 feet deep for 23 miles, all the riffles, runs, holes and pocket water gets ripped out. When you channelize a river it destroys habitat, biodiversity and water quality. If you feel compelled please follow the Friends group on Facebook. There you can get all the latest news and updates on this proposal. Hamlin Lake is in the middle of a creel survey, with the last one being done in 2009. The DNR has been talking to anglers everyday through the month of February. It’s always interesting to talk with a biologist as you can get a lot of information. He said most anglers are struggling but that we were doing quite well. With that said, Hamlin Lake for the past week has been tough. If your looking for gills, crappie or perch you’re going to have to move around to find them. Walleye has been slow but the pike and largemouth bass bite has been decent as we have brought a number to ice. We’ve been fishing on upper Hamlin in 9 to 13 feet of water. 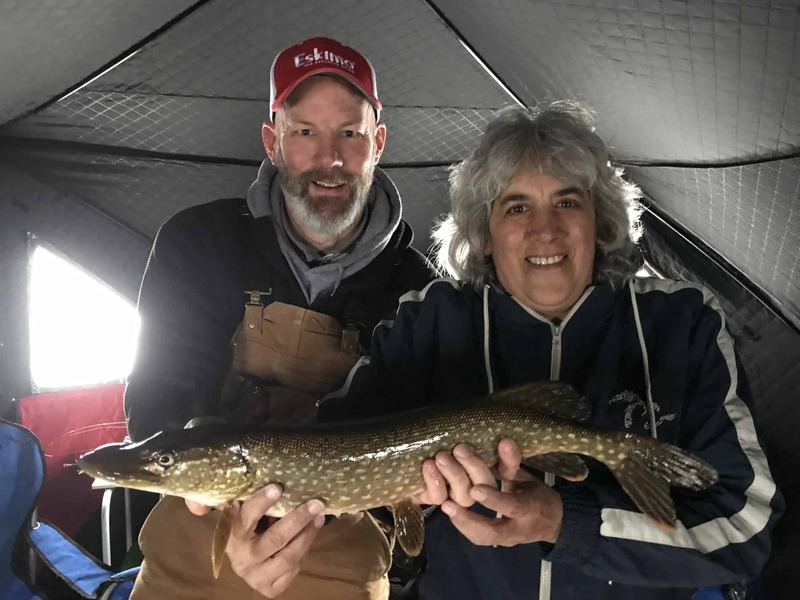 Most of the pike have been taken on the jig and they seem to come in waves, with stretches of no action, to all of a sudden you’ll get a hit while jigging and a tip-up will go off as well. That’s when the fun begins. We’ve had the best action jigging Rippin Raps, with no added bait, by Rapala in Hot Steel and Glow Hot Perch. Most of the action was on the up-take of the jig. What I like about these lures is the rattle noise they create while jigging. The nose is an attractant and if there are pike or walleye in the area they will come to check it out. When ice fishing, electonics are helpful. We have been using the Vexilar FL-8SE and as we mark the fish we tend to slow the aggressiveness of the jigging down to more of a twitch. They seem to prefer that. Once the fish comes up to the the jig we slowly went back to a more aggressive up-take, be ready as the pike are aggressive. We did take a few pike on the dead stick with a shiner attached to a Swedish Pimple. If you’re going to attempt this method us a 24 inch medium action rod, 8 lbs test, loosen the drag so it can almost fee spool. If you don’t and the fish hits it you will lose your rod. Once the drag starts clicking, open the spool so the fish can take more line, then tighten the drag, close the spool and set the hook. There is nothing like having a pike take drag out on these small ice rods. Let the battle begin. Ice is still solid at about 12 inches. Our gas auger had some problems and broke down so we went to our backup hand-auger. The ice is mostly black and the handheld cut through the ice just fine with little effort. 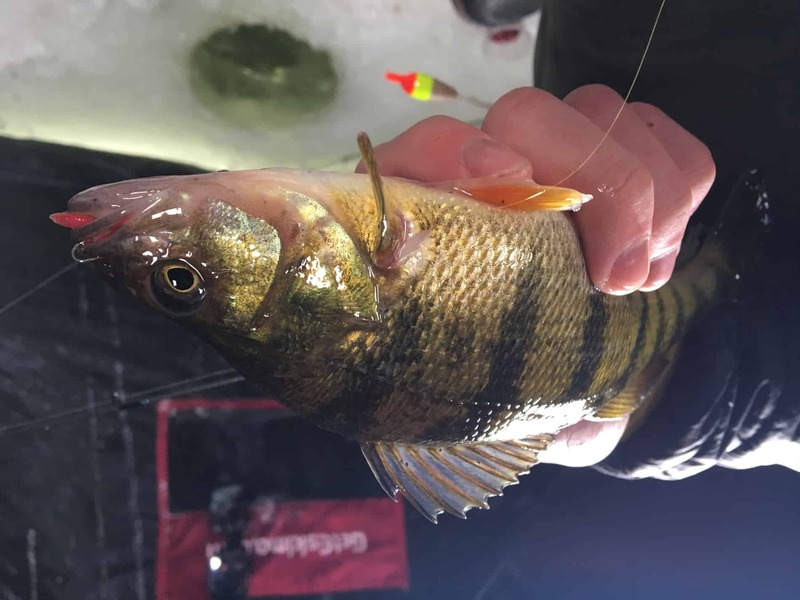 Ice fishing can be one of winter’s best activities. You can do it in large groups, it’s family friendly and in a heated shanty you have all the comfort needed for a day on the ice. Well like I’ve been saying and posting for the past month, the Polar Vortex has arrived in west Michigan. It’s about time. The area lakes are nicely freezing up. However, to be safe check with your local tackle shop to make sure. Here’s our fishing report. We’ve been fishing on Hamlin Lake up near Ludington, Michigan and have been doing very well. Ice is a solid 7+ inches. 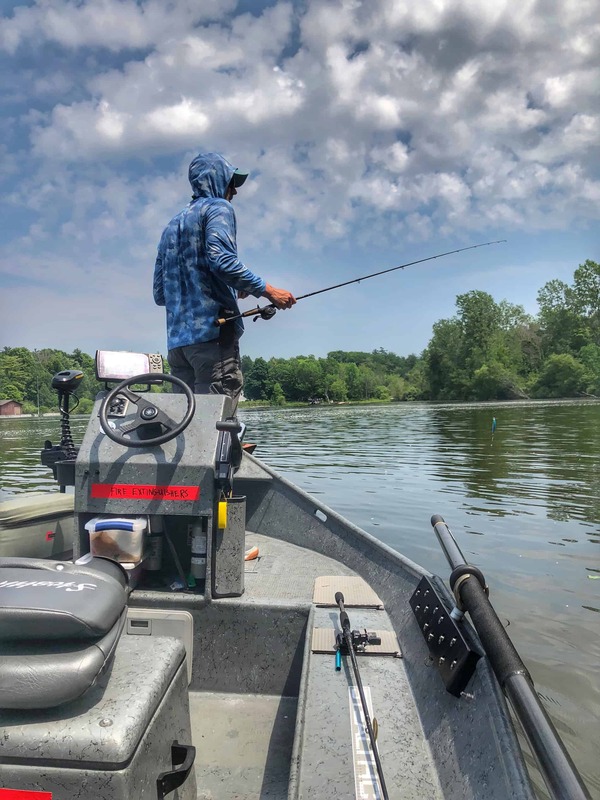 If you’re going to head up to Hamlin Lake, then you’ll want to hit the 10 to 15 foot range out from the boat launch off of Bugg Point. Use crappie or perch minnows dead sticking. We have been using 2 lbs to 6 lbs mono with a Swedish Pimple, silver, to get fish on the ice. Make sure that you connect the pimple or jig to a snap swivel to prevent the line from getting all crazy as a result of the minnow swimming around. If you don’t, that will definitely effect your presentation. If you want to target northern pike on tip-ups use shiners. But watch out, the pike have been theives. We’ve had many a flag only to see our shiners stolen. Try using smaller treble hooks placed horizontally along the shiners lateral line and remember to puncture the swim bladder. This will help create better bait movement and keep your bait at the desired depth. With that said, we’ve been finding the best way to catch pike right now is using a jig tipped with a shiner or blue minnow deadsticking. We’ve been having alot of action and success with this method. Be ready, as they smack with a vengeance and let me tell you there is nothing like bringing in a pike on a 24 inch medium action ice rod on 6 lbs test. The fight is incredible. The crappie bite has been coming at dusk. If you’re going to target slabs use either a bobber rig or a jig. Just make sure to tip it with a crappie minnow. The best part of fishing in Ludington is after you get off the ice head into town to Ludington Bay Brewing for a round of beer and great food. The rest of January will continue with sub-freezing temps and the climate models right now are calling for a colder than normal February. I believe that will be the case. Good news for ice fishing. Stay tune for more ice fishing reports. 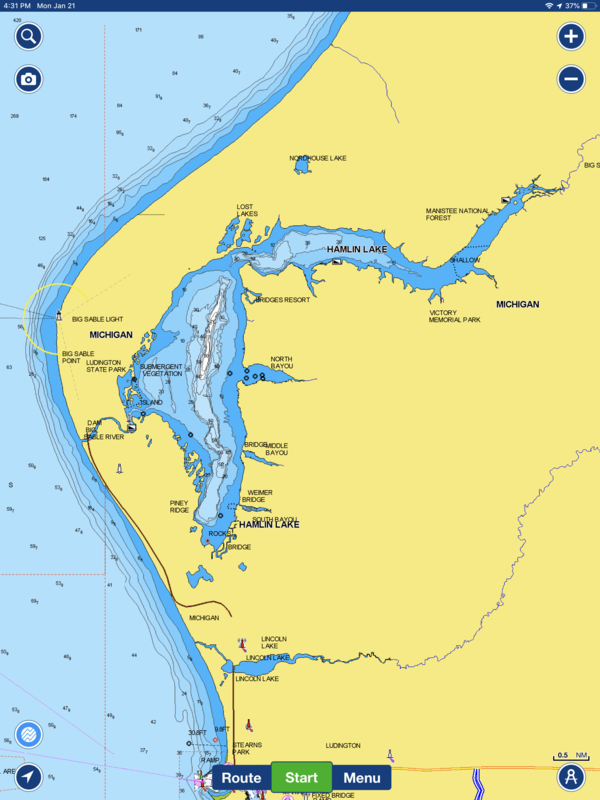 The port of Grand Haven is often known for it’s Lake Michigan charter fishing. These charter boats chase after salmon, steelhead and lake trout from spring through early fall and offer the angler the opportunity to catch the fish of a lifetime. However, this port also provides the angler with a different kind of opportunity. One that lies up river in the bayous and deltas of the Grand River. The Grand River reaches Lake Michigan at Grand Haven. 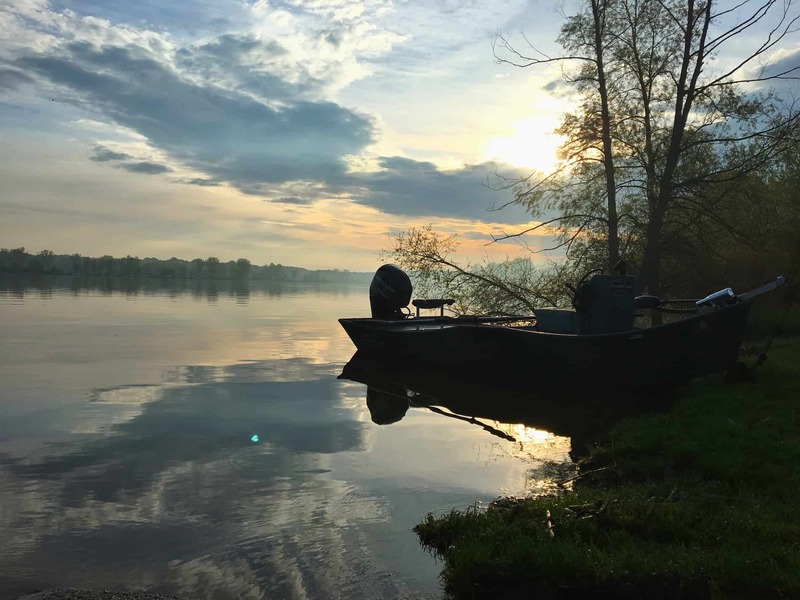 However, just before that the river forms its bayous and deltas which offer the angler some of the best productive waters for northern pike, walleye, bass and the occasional muskie. Here is where much of the fish production happens. As the nutrients flow down the Grand they end up in the lower sections of the river. These nutrients feed plankton and zooplankton which further feed bait fish, which inturn feed the larger predator fish. Spring is the time of year we fish the bayous and deltas for northern pike, walleye and bass. As the water temps begin to rise from ice-out, these fish start to become more active in search of food. They begin moving more into the shallows, patrolling weed and break lines to find and ambush the forage fish. During the spring the bass enter spawn mode. This is one of the best times to catch the “green trout” as they will aggressively defend their redd from anything that comes near it. The bite this time of year can be fantastic with many sight fishing opportunities. It’s important to remember that once they are hooked to quickly land and release them so they can go back to defend their redd from other predators looking for a quick meal off their eggs. Because of the stained nature, deep holes and access to Lake Michigan the Grand has a fantastic walleye fishery. Many of these holes can be found between Indian Channel and near the gravel pits up by the Bass River Recreation Area. When targeting marble eyes there will be a lot of incidental catches as the Grand is a very diversified fishery. So just be prepared. Typical techniques include jigging and trolling for them using a variety of lures and rigs. If you come to Grand Haven consider an alternative to a Lake Michigan fishing charter and try fishing for the Michigan natives that the Grand, its bayous and deltas call home. 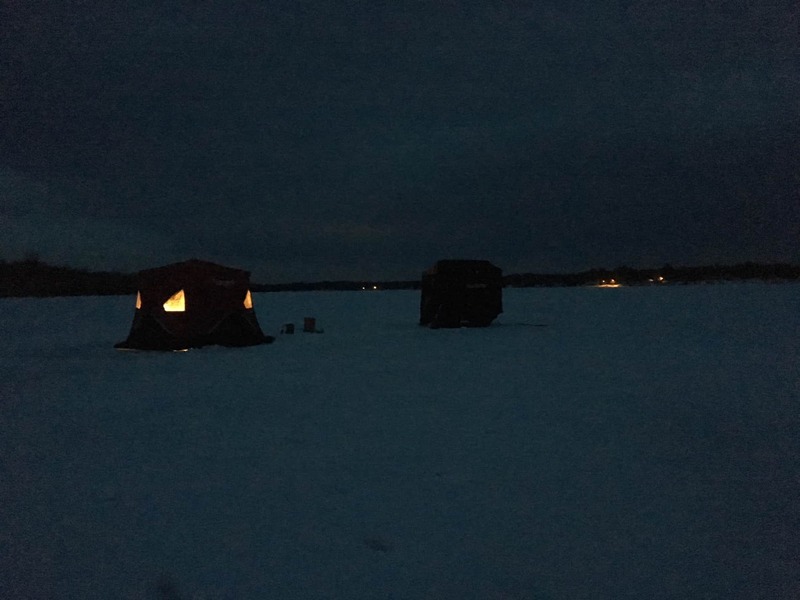 Yes, It’s an Ice Fishing Report!